Simply drive your scooter on to the platform nesting into the wheel pockets that have been set to the proper spot by MobilityWorks’ factory certified installers and push the button. Your vehicle must have a hitch in order for an exterior lift to be installed. If you do not have an existing hitch we can install one on compatible vehicles for an additional cost. Contact us for details. Engineered to withstand the toughest that Mother Nature has to dish out, the Bruno series of Out-Sider® scooter and power wheelchair lifts are unparalleled in their quality and craftsmanship. Made in America, from American components, these lifts are designed to fit on Class II and Class III hitches. The patented automatic fold feature senses when there is no weight on the platform and automatically folds tightly to the mast making this one of the most aerodynamic lift solutions on the market. The optional Swing-Away allows unobstructed access to the trunk or rear cargo area of your vehicle. Available in 5 different configurations, for over 30 years Bruno has been an industry leader and back their lifts with a 3 year warranty and parts and MobilityWorks adds a full 1 year warranty on labor. Simply drive your scooter on to the platform nesting into the wheel pockets that have been set to the proper spot by MobilityWorks’ factory certified installers and push the button. The automatic Hold-Tite foot comes down as the platform rises safely securing your scooter to the lift. No belts, no bending, no fuss. The certified installers at MobilityWorks will make sure your application is safe and has the proper distance from the platform to the road. Bruno’s warranty periods begin with the date of the installation of the Bruno Vehicle Lift. 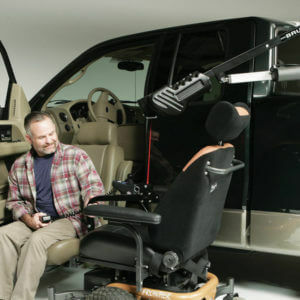 vehicle lift and are the first contact for any warranty or service needs. All labor by a Bruno Authorized Dealer after the first 30 days since installation. All Service and Warranty issues are handled through the Bruno Authorized Dealer that installed the unit. the purchase price at its sole discretion. Bruno Independent Living Aids, Inc.